"it's time to use the web again to store our ideas, and instead of relying on Silicon Valley companies to link our stuff together, let's just use the Internet." "47,000 enterprise customers and a ferociously loyal customer base"
"Set breakpoints, inspect variables and evaluate expressions from within Eclipse"
"won't be ejecting existing enterprise collab tools from the workplace any time soon"
"written in Java and is based on open source projects such as GWT, Hibernate..."
Even when you're mentally prepared for a layoff and you know it's probably for the best, its still a life-changing shock when it happens, a loss. It's hard not to feel fear, anger, sadness, self-recrimination and all those stages that fellow RIFee David Van Couvering blogged about. I still cycle through those, but not as frenetically as before. I got over the sadness and fear part pretty quickly thanks to my tweeple, the very supportive network of friends, colleagues, former coworkers, etc. that's grown around my blog, my work at Sun, my involvement at Apache Software Foundation and my social network accounts like Twitter. I got the word out on Twitter first and word spread quickly. I posted to my blog and some very kind friends, Tim Bray, Ted Leung and Robert Donkin helped spread the word on their blogs and said some very nice things about me in the process. Within hours a flood of supportive tweets, emails and calls come rolling in, including about a dozen real live job leads. So, thanks folks. I really appreciate the help. I'll keep you posted. In case you were itching to comment about the new Fauxcoly theme or Eclectic Roller hacks, comments now work again. I had broken them in my quest for XHTML validation. Happy New Year 2009 to one and all! I took a nice long break from work, complete with a Florida vacation, hot tubbing, theme parks and a mini-vacation to rest-up from the main vacation and now I'm back. I think I'm rested and ready to restart some things including work, of course, and this blog. Restarting a blog is not easy, or so I've heard. Here's what I did. I drew a big diagram on the white board with multiple colors, circles and arrows. I did some calculations and eventually figured out that what I need is a new theme. A little bit of eye candy for the couple of folks who end up here after a search gone wrong or accidentally clicking through as they skim over my blog in Google Reader; that's just what will re-ignite my blogging activities. My problems all have technological solutions. Funny how that works. So, if you've clicked through to my blog then you're looking at my new theme and newly restarted blog. Thrilling, huh? It's a simple faux-column deal like my old theme, but this time I'm taking advantage of Roller's new 'action' pages, I'm using YUI Grids CSS to define the layout and I'm including content from my other sites (Twitter, Flickr, Delicious, etc.) via aggregation. I'll provide some more details about the theme and it's features (and a download) in a subsequent post, after I've gotten some real work done. I'm honored, excited and now I'm prepared. Reminder: Guest Lectures on Work, Organization and Action. I remember how freaked-out I was to see the referrer hits start rolling in (pun fully intended) from http://blogs.sun.com/roller. I can't believe it's been four years already. Thanks to Linda for the reminder. My former co-worker Linda Skrocki and Program Manager for Sun's community sites (blogs, wikis, planets, forums and mediacast at sun.com) got some well deserved recognition from ReadWriteWeb.com the other day. She was named one of Seven leading Corporate Social Media Evangelists. Congrats Linda! Here's a concept that I've been using to help me both in my blog writing and to filter all the incoming feeds, tweets, photo sharing and social bookmarking items that come in via my feed reader: my A list. It's not made up of famous folks and big blog names like Scoble or Winer or Arrington. My A list is made up of people that I know or work with and that I believe are following me in some way, reading my blog, subscribing to my tweets or working with me on a project. I've got a folder in my feed reader and my A list is always the one I read first. Sometimes I don't get much farther than than before hitting the mark all read button. And when I do blog, that folder helps remind my of who I'm writing for. "A" stands for audience. I mentioned the Social Software for Glassfish (SSG) EA2 release before the winter break, but I never got around to posting any details. Since then some documentation has appeared, Manveen Kaur blogged it, The Aquarium too and now screen-cast master Arun Gupta has created an excellent Social Software for Glassfish screencast that walks you through the features in this very early access release. Now I don't have to say nearly as much. Apparently, CISCO has a pretty active internal blog server and it's running Roller. I can tell from my referrer logs. If any CISCO folks are reading this, drop me a line. I'd love to know how Roller and internal blogging in general is working out for you. Blog server as social networking platform? Anne Zelenka, Gigaom: Could open-source blogging platform WordPress serve as your next social networking profile? Chris Messina, co-founder of Citizen Agency, thinks so. Heâs started a project called DiSo, for distributed social networking, that aims to âbuild a social network with its skin inside out.â DiSo will first look to WordPress as its foundation. 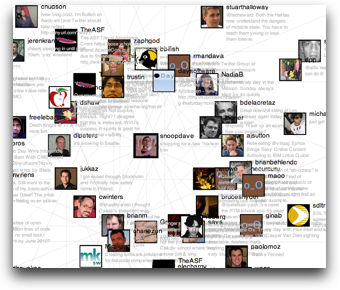 This could be the next step towards the unified social graph that some technologists wish for. WordPress suits the purpose because it provides a person-centric way of coming online, offers an extensible architecture, and already has some features â such as an OpenID and a blogroll plugin â that can be pressed into social networking service. And its users represent exactly the sort of audience that might appreciate the permanent, relatively public identity that DiSo aims to offer. Interesting. I think that blogs should be the corner-stone of social networking and I'd much rather have my blog be my social network profile rather than some page inside somebody else's container. Then again, as a blog server developer I'm pretty biased.